Top off that java … in a sippy cup? A Boston Medical Center study released last week found that coffee consumption among Boston toddlers is a common practice among certain groups. According to the study, approximately 15 percent of 2-year-olds consume as much as 4 ounces of coffee daily. It’s a practice, health experts say, that comes with a dangerous dose of health risks. The study followed 315 pairs of mothers and infants who were participating in an analysis of weight change during a child’s first week and its impact on body mass index at age 2. While examining diets, researchers found that 48 of the participating mothers were feeding their 2-year-olds coffee as part of their daily fluid intake. Infants and toddlers of Hispanic mothers were more likely to drink coffee than those of non-Hispanic mothers, according to the study, but researchers did not examine further to determine why. Female infants were also found to be more likely to drink coffee than male infants. Cultural practice may be one of the reasons some children drink coffee at younger ages, according to the study. In some countries, including Cambodia, Australia, and Ethiopia, children under 5 are given coffee. 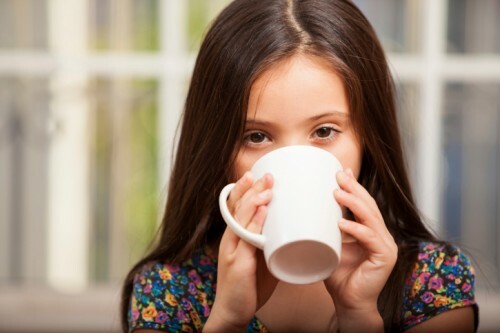 The U.S. Federal Drug Administration (FDA) has not provided guidelines on coffee consumption for children, but previous studies suggest there are potential negative health impacts, including Type 2 diabetes, depression, obesity and sleep disturbances. The American Academy of Pediatrics (AAP) recommends against the inclusion of caffeine in a growing child's diet. Deborah Schutte, M.D., cardiologist and medical director of Cardiology at Cook Children’s, said her chief concern regarding toddler coffee consumption is the cardiovascular effect, particularly increased heart rate and high blood pressure. Schutte also points out that giving toddlers coffee could lead to dehydration, particularly since caffeine is a diuretic. A 2013 study found that 2-year-olds who drank coffee or tea between meals or before bedtime were three times more likely to be obese in kindergarten. According to the FDA, the average American adult consumes approximately 300 mg of caffeine each day - the equivalent to between two and four cups of coffee. Canadian guidelines recommend no more than 45 mg of caffeine for children ages 4-6. This is equivalent to one 16 ounce can of soda. If parents are already giving their toddler coffee, it’s possible to wean their child off the caffeinated beverage, Steelman said. He recommends parents talk to their pediatrician about a weaning off caffeine schedule.